Have you received a letter stating you must get a certified backflow testing contractor in Ft. Myers,Bonita Springs,Estero or Naples, FL to test your device? Backflow testing in Ft. Myers or Naples should be done when they are first installed, moved, repaired or once every year to insure they are working properly. Moen Brothers Plumbing & drain is certified for backflow testing and repair in Ft. Myers,Bonita Springs,Estero and Naples,FL. We handle all the paper work to register your backflow testing with the proper agencies. We have competitive rates and discounts to associations or commercial property owners with multiply devices requiring backflow testing and repair. The most common backflow testing and repair in Ft. Myers or Naples is on the Wilkins Zurn 975XL( Reduced pressure Principal device). We stock the repair parts for this backflow in our trucks as these backflows are on a majority of homes and commercial strip malls water service. Many seasonal residents of Fort Myers or Naples shut off their water supply when not occupying their Florida home. Some of these homeowners shut the backflow valves off or have been instructed by a previous plumber to shut the backflow valves off when leaving. 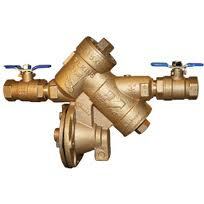 The two ball valves on your backflow device are installed for the purpose of testing or maintenance. These valves must hold tight during testing so they should not be used as a regular home shut off. Your homes main water shut off should be a gate or ball valve installed just before the pipe enters the home. Ensure this valve is operating correctly and use it to shut your homes water off. Here in Southwest Florida, a plumbing contractor may repair a backflow device but must have a backflow certification to test it. As stated in the first paragraph, backflow devices should be tested when they are first installed, moved, repaired or once every year. Call the certified backflow device contractors at Moen Brothers Plumbing & Drain to properly repair and test your backflow prevention device. One of the more common problems associated with backflow devices are leaks or lawnmowers running into them. They are usually installed just after the water meter. The usual question after they have been hit is, “can you move it or install it underground”? No, The Wilkins Zurn 975xl is designed to dump the water out if a backflow condition occurs, for this reason it must be installed 12″ above ground and close to the water line it is protecting. These devices are installed to protect the Ft. Myers or Naples city main from the possibility of homeowner contamination. For example, submerging your garden hose in your pool while filling at the same time as a backflow condition could lead to your pool water getting sucked back into the city main. In this case, the backflow device would open and dump the pool water out before it reached the city main. 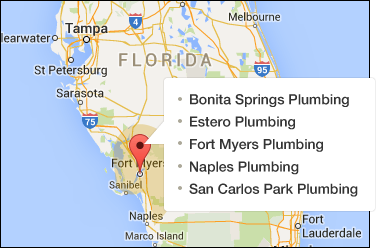 If you are in need of backflow testing or repair in Ft. Myers or Naples, do not hesitate to call for a quote. Backflows are the reason some of you have an extra small 2 gallon thermal expansion tank installed above your water heater. Before the days of backflows, Thermal expansion would simply dissipate or expand out into the city main. Backflows prevent thermal expansion and contamination from entering the city main. The small 2 gallon expansion tanks are necessary on backflow equipped homes to allow for the water heaters thermal expansion. Backflow devices and pressure regulators create a closed system. Water can only move in one direction across these devices so your homes system is considered closed. In an open system, thermal expansion has a much larger system to move across. If you have any questions or would like to schedule an appointment, don’t hesitate to call your local backflow testing and repair experts at Moen Brothers Plumbing & Drain.